Dylan Thomas is the writer who made me love poetry with his dark imagery and almost primal language. He is often compared to D.H.Lawrence and Thomas Hardy but I’ve always placed him side-by-side with Federico Garcia Lorca, one of my very favourite writers. Their inclination towards the darkest depths of the human soul, the use of a chaotic, punishing nature and a tradition that inspires and oppresses produced unparallel literary moments. Thomas’s A Child’s Christmas in Wales always brings my own childhood Christmas to mind. Christmas festivities spent in a city very different from the one in the story but no less nostalgic and mischievous. Long gone are the innocence and the ‘’what ifs’’ of a carefree childhood. They have been replaced by (not always welcome) knowledge and the uncertainty of reality. 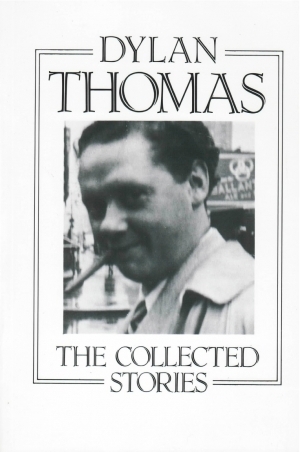 For me, Dylan Thomas’s work is a mirror that exposes everything that is hidden within us, the good and the evil, presented in a highly allegorical, raw language that fascinates and terrifies. Most of the stories included were written for the Swansea Grammar School Magazine and are clearly the products of a unique mind. Many would consider the Portrait of the Artist as a Young Dog to be the gem of the collection but I am always drawn to the dark, the twisted, the macabre. Apart from A Child’s Christmas in Wales, which makes me feel as if I am about to put up the Christmas decorations even though Easter is only three weeks away, the stories that touched me soul are the children of a pen that produced a world of madmen and children fascinated with a tragic Crucifixion. A world populated by the exiled, the discarded, the isolated. A world of dark fairytales and Welsh legends, myths and twisted folklore, sexuality and mysticism. A world that makes you walk with beggars, fugitives, heathens, and witches. A world where nature becomes a pagan altar where you dance with murderers and sinners. What material could be more ideal to create stories for demanding, doubting minds? These are the stories that I have read again and again over the years. I will leave our favourite Christmas tale aside for now to enter a deep, murky darkness. The Tree:A story that brings Edgar Allan Poe to mind, inspired by the Stations of the Cross, with a child strangely fascinated by Christ’s ordeal. The Jarvis Hills become a Welsh Golgotha. Or the Promised Land? Hard to distinguish the two in Thomas’s work. After the Fair: I’ve always wondered what happens to the energy of a place when a fair ends. There is an intense melancholy and a ‘’where will the next fair find me?’’ question that have always touched my soul. This story is clearly influenced by Joyce and his After the Race story from Dubliners, and echoes Dostoevsky’s insight into the nature of the exiled, with two characters that deserve their own novel. A strange girl with a baby and a Fat Man. The Dress: A nightmare born out of passion and restless persecution. A man’s obsession with a woman who acquires the role of the angel of temptation, a dark goddess whose realm is the pagan nature. The Visitor: The Visitor that is sure to come to us one day, the Visitor that is usually uninvited and unwanted. The Visitor that doesn’t ask but gestures and we have no choice but to follow. A story where fairy tales and poetry create a dark fable. The Vest: A story full of terror and dark sexuality. A dog, a terrible love and a deep sickness of a man whose obsession results in darkness and murder. A powerful text that makes you wonder on the chaos that was residing in young Thomas’s mind. The Burning Baby: If there is a story that could surpass The Vest in terror, now obsession and twisted inclinations, it would be this. Nature is violated and becomes a product of a monstrous birth. It wants revenge and justice and works in mysterious ways. Hypocrisy, false piety, distorted images of love, Biblical punishments compose one of the most viciously powerful stories that you’ll ever read. ‘’The wind howled over Cader, waking the sleepy rooks who cawed from the trees louder than owls, disturbed the midwife’s meditations. It was wrong for the rooks, those sleepy birds over the zinc roofs, to caw at night. Who put a spell on the rooks? The sun might rise at ten past one in the morning. Thank you, Paula! How can anyone resist Thomas’s powerful writing?